Given the polls at the time in the U.S., pollsters in London saw that boast as a stretch — but early Wednesday morning, Trump delivered on that pledge. 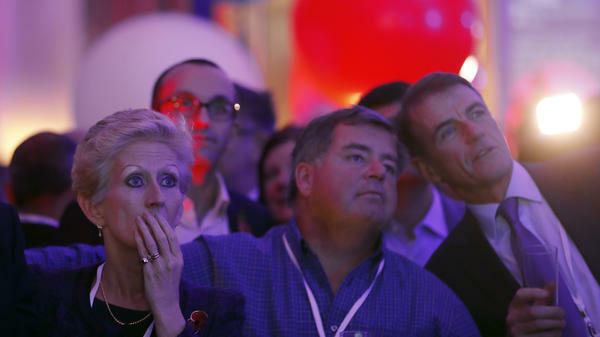 At the election party Tuesday night at the U.S. Embassy in London, most Britons were shocked by how well Trump was doing. Munching on burgers and shakes from Shake Shack, they watched in disbelief as the electoral map turned increasingly red. For some, the results confounded their notion of America as an open, tolerant society. "It's just blown my mind that an individual such as Trump can have such a following," said Jared Reeks, a member of Young Leaders UK, a group of Britons who are fans of the U.S. and focused on sustaining and improving relations between the two countries. As Trump did in North Carolina, Reeks likened Trump's showing to the shock that followed the Brexit vote, when more than 17 million Britons voted to cut ties with the EU, the world's largest collective economy. "It's terrifying," Reeks said of the Brexit vote. "It's kind of like, 'Well, what do we do now?' And we're still trying to figure that mess out, and the reality is: No one has a clue." "It's overwhelming for me to see the huge amount of disenfranchised people who feel the government has failed them," said Hawley as CNN prepared to call Ohio for Trump. They feel "that there is nothing left for them — that any change is good." Hawley likened some rural Trump supporters to people in the northeast of England, communities who felt left behind by globalization and who saw Brexit as a protest vote against the political leaders in London. "I really feel that Britain knows that you're going through," she said. "We went through Brexit, and the country was completely divided. Love each other, even though you have differences." We're going next to London and the United Kingdom, which had a dramatic vote of its own over the summer - a vote to leave the European Union. Many people compared that vote in Britain with the election in the United States. And today, that comparison is ever more explicit. In London is NPR's Frank Langfitt. Frank, how are you? INSKEEP: So how did people respond where you are? LANGFITT: Well, I actually went to the U.S. Embassy last night. There were a lot of British people there, as well as U.S. ex-pats. And people were shocked. It was a very pro-Clinton crowd, and there were lots of comparisons to Brexit. Here were the similarities that people really ticked off. One thing is this really upended conventional wisdom. This - you know, people were expecting a vote for the status quo in the U.S. and to stay - stay in the EU last summer. Also a sense that this was fueled, to some degree, by white voters who are uneasy about the changing racial makeup of their countries. You also had a lot of people in England and in the U.S who've lost industrial jobs to globalization, whether you're talking about Detroit or northeast England. And just also a sense that you had a populist anti-establishment message that really resonated. INSKEEP: You know, you mentioned the concern about changing demographics. The one really clear thing that people in Britain seem to be able to agree on is that they want to regain control over immigration, regain control over who comes and goes from Britain. LANGFITT: Absolutely. And that - that has continued to be a big issue. And it's not clear exactly what Britain's going to do about it because, in order to get that, they're going to have to give up access to the European Union, which is going to - going to basically have the economy here take a big - pretty big hit, I think. INSKEEP: Any idea what a President Trump means for the special relationship, as it has so often called, between Britain and the United States? LANGFITT: Well, Prime Minister Theresa May, as you would expect, said that it will continue. It could be helpful in terms of bilateral free trade. Trump, of course, was against Brexit and basically said that he would treat Great Britain really, really well in a bilateral free trade agreement later. But there's also concern about NATO because Mr. Trump has said that he might not really want to protect, say, the Baltic states. And that, of course, makes the British pretty - pretty concerned. INSKEEP: And other NATO nations, as well, will be wondering what Donald Trump does about that. Frank, thanks very much. And let's continue following reaction to last night's election results. How are the markets reacting? NPR economic correspondent John Ydstie is the studio with me. Morning, John. JOHN YDSTIE, BYLINE: Hi. Hi, David. GREENE: So what are you seeing in the markets right now? YDSTIE: Well, initial response in Japan overnight was dramatic. The Nikkei was down 5.5 percent, or almost that. U.S. futures initially plunged, too, down about 5 percent, but now it's looking like U.S. stocks will open only about 1.5 percent down at 9:30 a.m. when they open. GREENE: Not that significant a drop. YDSTIE: I'd say not that significant, yeah. GREENE: So when you see drops like this after an election like the one we saw last night, is it - is it the unpredictability of it? Is it not knowing who Donald Trump will be as a president? I mean, why do markets react in this way? YDSTIE: Yeah, I think it's uncertainty. Hillary Clinton was the status quo. We probably wouldn't have gotten that if she had won. But there's uncertainty about Don Trump - Donald Trump. He really doesn't have a guiding economic philosophy. His views on trade are a lot like those of unions, usually associated with the Democrats. On the other hand, his views on income and business taxes are very Republican. And at this point, investors are just trying to figure out exactly what Trump is actually going to do and how it's going to affect them. GREENE: OK, we're chatting throughout the morning with NPR's economics correspondent John Ydstie. John, thanks. YDSTIE: You bet. [CORRECTION: In the audio version of this story we say that Donald Trump opposed Britain’s departure from the European Union. In fact, Trump supported “Brexit.”] Transcript provided by NPR, Copyright NPR.